"An old friend once told me every guitar has its song. I also believe every guitar has its optimum string and pick match. Find the right strings for the right guitar, including creating hybrid sets that aren’t available. (Got an unwound third?) It’s worth going down the rabbit hole and trying strings you will ultimately replace after 30 mins. My 1965 Gibson J-45 was always a challenge to find balance between the highs and lows. A few years back, at NAMM, I discovered the Martin Guitars Clapton signature strings—they’re absolutely magical on the Gibson and I have found no equal. My nearly 100-year-old Washburn parlor guitar sounds best with silk and steels, my Breedlove loves DR [nickel] strings. My checklist when I receive a new acoustic guitar includes removing the nut to lower it for better intonation, as well as evaluating the nut and saddle material. I have always been a fan of bone, with its direct crisp, transfer of sound, almost like a maple fingerboard. I have also thoughtfully planed braces inside some of my favorite acoustic guitars to give them more life. For my harp guitar, carefully cutting a line between my fretting and sub-bass strings on the bridge plate made all the difference in the world when it came to amplifying, separation, and transference of frequencies. I have also found that transcribing melodies from different instruments, such as mandolin, sitar, banjo, vibraphone, piano, and even horns (for example, John Coltrane and Miles Davis) has enlightened me to the need for different attacks on notes and nuances, such as ghost notes I had not realized on guitar previously. Experimenting with different picking positions on the guitar, such as by the bridge or over the soundhole or even as far up as the 12th fret. These are great sources of tone choices as well. Also, I’ve found that I can create a softer dynamic by placing my hand in front of the soundhole while I am picking." "From the opening of “Bo Peep” to the last notes of Jaded Mary’s self-titled disc, self-released earlier this year, there’s a fullness of sound and a confidence a band such as this absolutely must have in order to gain any credibility in a genre that is popular and thus, full of competition. There’s a good reason this band has opened for a huge list of national touring acts like Presidents of The United States of America, Jason Bonham and The Healing Sixes, Buckcherry, and Skid Row, they are one of the best at their game in the northwest. Other credits on this album go to The Tank Studios, engineer and producer Tom Pfaeffle, engineer Austin Healy, Studio Litho, and producer Timothy Eaton. One song, “Scene,” was engineered by the prolific Floyd Reitsma, who’s been credited on a great number of records I’ve reviewed lately. Together, this team of audio experts realized the band’s vision and created a sparseness on several of the tracks where the spaces allow the music to breathe, creating a greater impact. It’s in the absence of or reduction of layers when the songs become whole. The diversity of the band’s influences lends strength and sureness to the performances of this collection." "Jaded Mary warmed the crowd up with its own brand of rock meets progressive rock, powered by the extremely blistering licks of axeman Tim Bertsch and the powerful vocals of frontman David James. Their 10 song set electrified and pumped up both the fans that came to see them and the greater number that were there to see The Tea Party. With several fans bouncing around with lighted green devil horns on their heads, it was clear people came to have fun." "KISW 99.9 FM was the proud sponsor of an unusually strong lineup at El Corazon on December 17th. 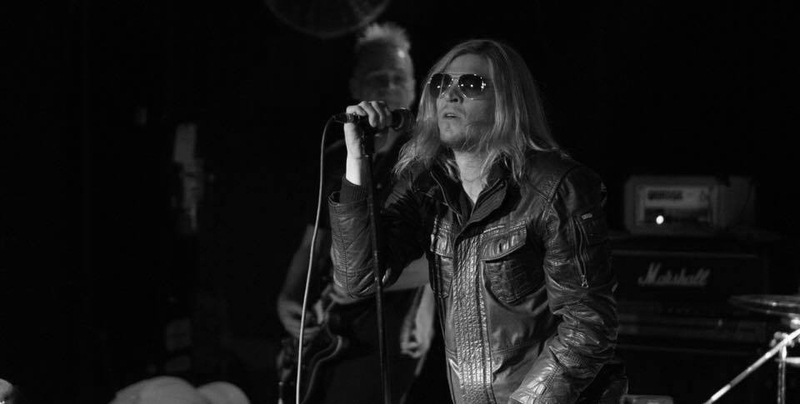 Headliner Puddle of Mudd hadn’t toured through Seattle in over two years, so the die-hard post-grunge enthusiasts were out en masse. The line to get into the venue stretched around the block, but the fan’s anticipation was strong enough to distract them from the current cold spell hitting the northwest." 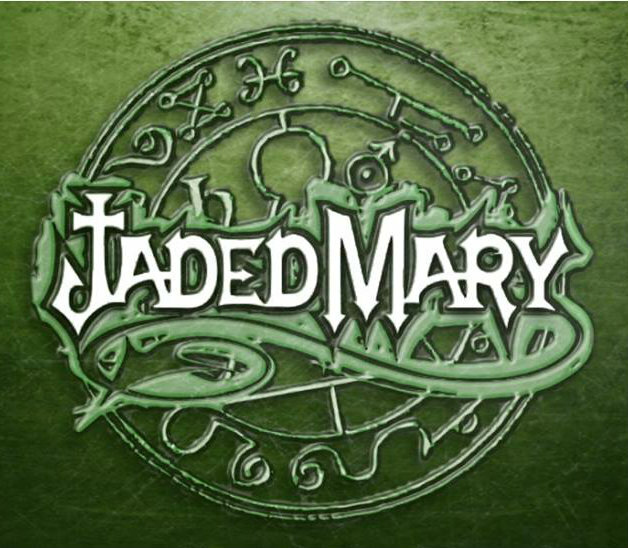 "Jaded Mary was third in line, a four-piece prog rock band who mixed in a fair amount of rap metal and homegrown grunge. Vocalist David James was uninhibited by either instrument or personality, immediately belting out intro vocals (“Chakakaka!”) that were well-timed with guitarist Tim Bertsch, bassist Jamal Horner and drummer Leif Wagner. Early in their set, David James coaxed the audience to get naked, daring them to throw (ANY) articles of clothing up to the stage. What looked like a blouse flew in from the left, but the band had already refocused on their music. Slashing through technically precise, passionately aggressive numbers that should’ve started a mosh pit, Jaded Mary took home the “most spirited” award of the night." About the Artist: "Reading their bio” The music of Jaded Mary is a reflection of their diverse influences, rare chemistry and exceptional musicianship. The pursuit of their creative vision produces a unique and relevant sound that challenges the boundaries of musical creativity. I agree with that statement. Their latest EP Xposition contains 5 tracks and was released in 2012. I always listen to the opening track extremely carefully. It’s the opening track the band or artists has selected to hit your ears first and foremost. Let’s just say “Bo Peep” the opening title track sets the stage rather well for this EP. It was a great intro piece that stuck in my head and had me eager for what lied ahead. All in all the whole EP is brilliantly delivered with a powerful Hard Rock, guitar driven sound with songs that hit hard and has serious staying power. Music will remind you of typical bands Saliva, Seether, Puddle of Mud and even Buckcherry to Alice in Chains. To be honest I can’t say enough about this bands overall sound. This body of music will keep you mesmerized and hypnotized throughout its 5 track run and is noting short of pure gut level rock-n-roll. An 5 song collection of songs written and performed by Leif Wagner (drums), Jamal (bass), Tim Bertsch (guitar), David James (vocals). Ironically nothing here sounds overly-Seattle but they defiantly have a sound that favors the late 90’s Alternative Rock movement. I’ve never heard a new band combine so many elements into a fused sound before. Jaded Mary represent a fresh new voice in modern Seattle rock and present a strong musical message that’s aggressive, powerful and impassioned. David James has an amazing voice and the guitar work from Tim Bertsch is beyond impressive. Xposition EP manages to capture lighting in a bottle and is very loud, in your face musical statement. My favorite tracks are Lines and Calumiator. 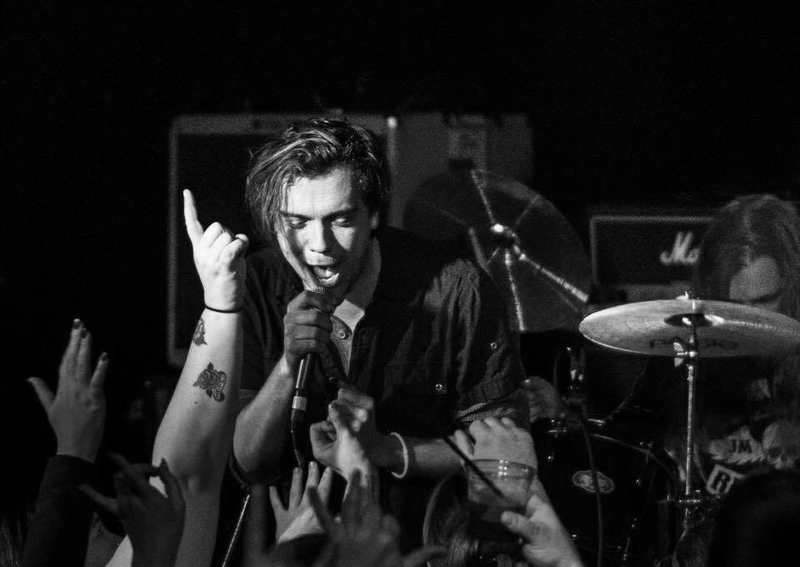 They may have a modern Seattle sound but the true Rock n’ Roll spirit will always remain the same here. 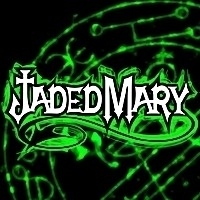 If there was one word I would use to describe Jaded Mary it would be diversified. This CD methodically combines many amazing things but does not try to hard to do so. How is this possible? It’s a by product of one being themselves musically. I Especially like how Jaded Mary sound like Seattle without trying to sound like Seattle. In close Jaded Mary delivers the goods on Xposition in so many different and unique ways. But more importantly it proves old school Alternative Rock n’ Roll is still alive and well up in the Emerald City." "Last year, Guild embarked on a new era of US production, rebirthing classic models built at its factory in Southern California. Watch above as Schmidt provides some background on the historic axe, first introduced in 1968 as a special-order, top-of-the-line model and added into full production by 1974, then listen as guitarist Tim Bertsch demonstrates its sound. The D-55 was famously played by Tommy Smothers (on the Smothers Brothers Show), Waylon Jennings, Billie Joe Armstrong, and David Nail. The D-55 — seen here in antique sunburst — remains true to its 1968 predecessor, including a AAA Sitka spruce top, solid Indian Rosewood back and sides, ebony fingerboard and bridge, and nitrocellulose finish. Internal refinements include scalloped Adirondack bracing as well as an improved dovetail neck-joint. It hits stores in February 2017." "Fingerstylist Tim Bertsch performs the tender ballad “Ann’s Parlor,” on a 12-string harp guitar, at Winter NAMM 2016. He has been a longstanding member of the rock dynamo Jaded Mary, as well as the seasoned jazz group H.D. Fusion, sharing the headliner billing with such national acts as Halestorm, Buckcherry, Sevendust, Saving Abel, Filter, Helmet, the Tea Party, Tantric, Duff McKagan’s Loaded, Jason Bonham, Adelitas Way, Red, Local H and many more. He has studied with the likes of Larry Coryell, Emily Remeler, Beppe Gambetta, Joshua Breakstone and John Stowell." Date: Friday, Dec. 12, 2014, at 9 p.m.
"This all-ages show at The Showbox features headliner The Tea Party, a blues and progressive rock band from Ontario, Canada. The band was originally together from 1990 to 2005 and then reformed in 2011, releasing the album Live from Australia in 2012 and The Ocean at the End in Sept. 2014. Band members include lead vocalist and guitarist Jeff Martin, bassist Stuart Chatwood and drummer Jeff Burrows. The opening act of the night, Jaded Mary, hails from Seattle, Washington, and in the past has been chosen by KISW, The Rock of Seattle, as the "Loud and Local band of the week." Weekly Workout lessons usually involve techniques that are physically challenging on the guitar. However, this month’s exercises are more conceptual than technical. You’ll focus on transposition—the act of moving music from one key to another while keeping its basic structure intact. Being able to transpose is a valuable skill to have up your sleeve. Among other applications, you might be hired to accompany a vocalist who can’t sing a tune in its original key; you might like to make a guitar-friendly arrangement of a piano composition that’s in a tricky key; or, you might simply want to explore the way a melody sounds in different keys. No matter the style or application, learning to transpose will undoubtedly make you a better guitarist, while improving your overall musicianship. A capo allows you to easily play a song in a different key. However, don’t shortchange yourself by relying on it exclusively and not investigating and understanding the theory behind transposing. The art of transposing requires a grasp on theory fundamentals. If needed, begin your workout by refreshing yourself on key signatures, minor and major, sharp and flat; basic intervals; and the Roman numerals used to describe the functions of chords in progression. A relatively effortless method of transposing involves the use of a capo, which can be placed at different regions of the neck, allowing common grips to sound as new chords. Try a I–IV–V–I progression in the key of C major, as shown in Example 1. Next, place a capo at the first fret and use the same grips (relative to the capo). This yields a I–IV–V–I in the key of C# (C#–F#–C#–G#). Move the capo to the second fret and you’re playing in the key of D. In fact, you can move the capo farther up the neck to play the same chord grips in all 12 keys. A technique unique to the guitar involves transposing by retuning the instrument. For instance, try the i–iv-i–v progression as shown in Example 2. If you’d like to play it in D# minor without using barre chords, just tune each string down by a half step (low to high: Eb Ab Db Gb Bb Eb) and you’ll automatically sound in Eb. Now begins the real mental work. In transposing, as with anything else in music, there’s often more than one way to conceive of what you’re doing. This week try a vertical approach—that is, transpose a melody by relocating each note by a given interval. Take a simple phrase in the key of C (Example 3a). Let’s say you want to transpose it to the key of D major. First, determine the intervallic distance between these two keys. D major is a major second above C major. So, to play Ex. 3a in D major, move each note up a major second (remember, the equivalent of two frets), as in Example 3b. To transpose it down to the key of D major, lower each note by a minor seventh (Example 3c). Try transposing Ex. 3a—and all of the subsequent exercises—to other keys as well. When learning to transpose, use traditional songs like “Amazing Grace” and “Down in the Valley,” as they tend to be both melodically and harmonically concise. They’re also familiar-sounding, so your ear will help guide you. Instead of conceiving of things vertically, you could take a horizontal approach when transposing. Begin by identifying the interval between each pair of notes in a melody, as demonstrated in Example 4a, which is in the key of G major. (Remember, P = perfect, M = major, and m = minor.) Next, apply the same sequence of intervals to a different starting note (Example 4b). You’ve now re-created the same melody in a different key—namely, B major. Because of the layout of the fretboard, you can take a melody and transpose it simply by moving it up or down a given number of frets—unlike on other instruments, such as piano or saxophone, which require a new position for each new key. 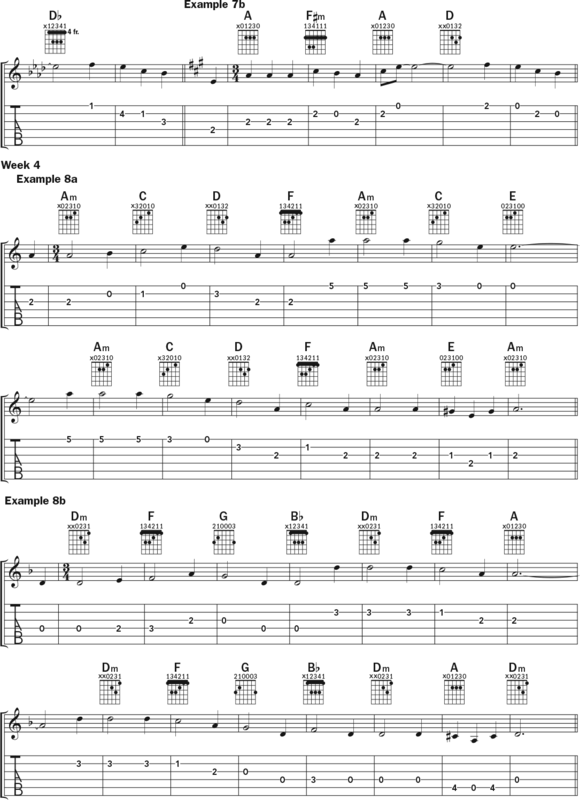 Try Example 5a, which is derived from the A natural minor scale. Take the same fingerings, on the same string set, and move the melody up a major second to play it in the key of B minor, as in Example 5b. And because of the symmetry of standard tuning—the bottom four are arranged in perfect fourths—you can transpose the same melody down a fourth, to the key of F# minor, by moving it one string set over (Example 5c). A great way to begin the process of transposing with numbers in relation to keys is to practice basic major scales, counting each note as you progress. This week you’ll work with melodies with chords. Take the bluegrass classic “Sandy River Belle,” notated in the key of G major in Example 6a, and play it in D. It’s easy to transpose between these two keys if you think of each note as a number in relation to the scale. The song begins with the note D, which is the fifth note of the G major scale. Find the fifth note of a D major scale—A—and you can build the rest of the melody in relation to the new key (Example 6b). To transpose the chords, relate them to the Roman numeral system. The first chord, G, is the I and the other chord, Em, is the vi. Swap each chord for the exact Roman numeral in the new key—D and Bm are the I and vi chords in D major—and repeat this process for the next examples. Your next exercise might be a bit trickier, as you transpose a passage from the traditional Irish tune “Rosin the Bow” from the key of Ab major to the key of A major (Examples 7a–b). But don’t be intimidated by that first key signature, with all its flats. Approach the task at hand systematically, like you did with the previous examples, and you’ll be right on track. 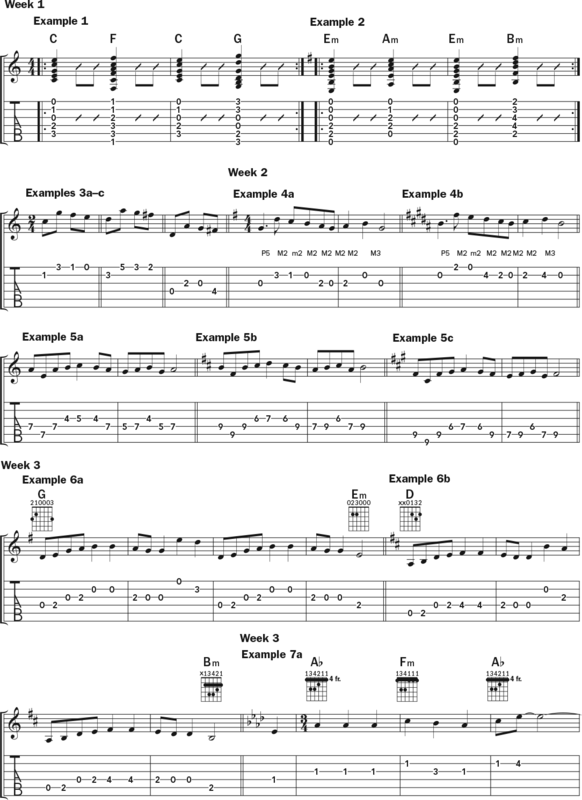 Take one basic song and transpose it up a minor third using all of the methods covered in this Weekly Workout. This week you’ll put everything together in exploring transpositions on the traditional song “House of the Rising Sun.” At first glance, this tune might seem pretty straightforward, but it’s less so than the previous examples. Though it’s written in the key of A minor in Example 8a, you’ll see the note G#, which falls outside of the key. Likewise, the diatonic v chord in A minor is E minor, but here it’s played as major. And, though the iv chord in a minor key is normally minor, here it’s major (D). Remember to consider these sharp notes as you prepare to transpose “House of the Rising Sun” to a new key. I’ve done the work for you in Example 8b, writing the tune in D minor, but with your newfound skills, try transposing it to other keys as well. Do the same with some of your favorite songs, and you’ll be a better musician for it. The task of transposing complex passages and long compositions can be daunting, but with notation software like Finale or Sibelius, it can be a painless, educational, and even enjoyable experience. These and other programs allow music to be input in one key and changed to any other key with the click of a mouse. Transposing with notation software can be exceptionally beneficial when composing and arranging, checking previously transposed pieces for errors, and much more. Although there’s often a bit of a learning curve upfront, the rewards of mastering the extensive capabilities of such programs can save you time, frustration, and countless revisions. Ever since the Middle Ages, modes—certain types of scales—have been an important component of Western music. The concept of modes dates to the ancient Greeks and was a central part of their music theory. Used heavily in Gregorian chant, modes were also the basis of European art music for over a thousand years. More recently, modes have been employed in all kinds of music—everything from folk songs to modern jazz to blues and rock and beyond, and in the work of guitarists like Jerry Garcia, Carlos Santana, and many others. In this lesson, you’ll meet the major scale’s seven modes—Ionian, Dorian, Phrygian, Lydian, Mixolydian, Aeolian, and Locrian—and learn how you can use their distinctive sounds to create more interesting melodies and chords. A useful way to think of modes is as scales within a scale. 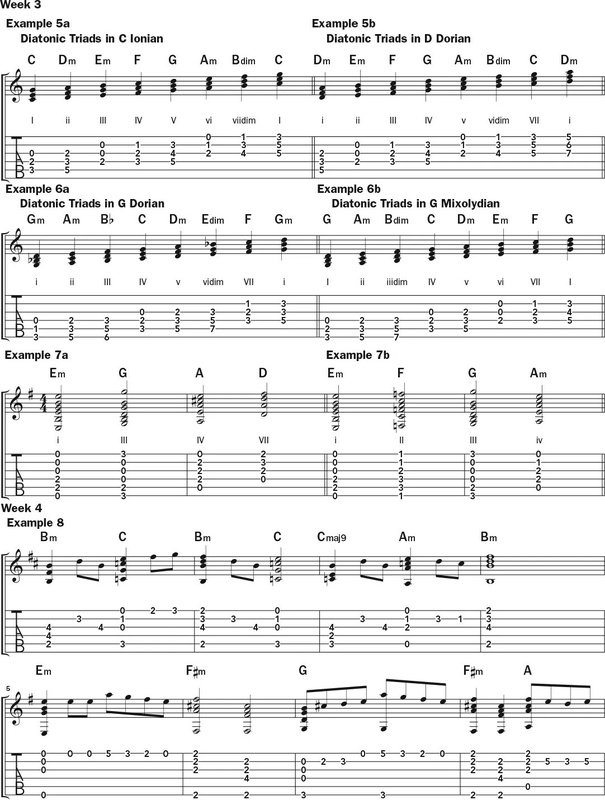 Example 1 depicts all of the modes in the C major scale, which is written in two octaves: Ionian (from C to C), Dorian (D to D), Phrygian, (E to E), Lydian (F to F), Mixolydian (G to G), Aeolian (A to A) and Locrian (B to B). Although these seven modes share the same seven notes, each one has a distinct sonic identity because every mode begins on a different degree of the scale. Ionian, Lydian, and Mixolydian sound major, while Dorian, Phrygian, and Aeolian sound minor; Locrian sounds diminished. Also, Dorian is often described as “jazzy,” Phrygian as “Spanish,” Mixolydian as “bluesy,” and so on. Be sure to play through all the modes to make your own associations, and keep in mind that Ionian and Aeolian are identical to the major and natural minor scale, respectively. The measures in Example 2 offer a more direct comparison of the seven modes, as they’re all based on the tonic note of G. The numbers above the standard notation depict each mode’s construction relative to the major scale, and the letters between the standard and tab lines convey the patterns of whole (W) and half (H) steps. Memorizing these formulas will help you build and identify modes and modal compositions. Try playing each mode with a corresponding root-note drone. For example, play the notes of a D Dorian mode over a ringing open fourth string, an E Phrygian mode over the sixth string, etc. This will help your ears get accustomed to each mode. Many popular melodies are modal. Example 3, for instance, depicts a passage from “Scarborough Fair,” an English folk song that was also a hit for Simon & Garfunkel. The tune is in the key of A minor, and though most of the melody is drawn from the A natural minor scale (A B C D E F G), in bar 7, the appearance of the raised sixth (F#) suggests the A Dorian mode (A B C D E F# G). In Example 4, you’ll find a bit of the classic folk song “Old Joe Clark.” Although the key signature indicates A major, each odd-numbered measure has a G natural, so you can think of the melody as coming from the A Mixolydian mode (A B C# D E F# G). Take the time to create basic melodies with as many modes as you can. It can be helpful to begin with the tonic (first note) of each mode you are using so that you get acquainted with its distinctive sonic identity. This week, you’ll learn how the modes of the major scale relate to harmony. Remember that when harmonized in stacks of thirds, the notes of the major scale form triads (three-note chords). Example 5a shows all the triads that occur naturally in the C Ionian mode/C major scale. Uppercase Roman numerals stand for major triads (1 3 5) and lowercase represent minor triads (1 b3 5); dim is short for diminished (1 b3 b5). The same triads within the C Ionian mode are found in D Dorian (Example 5b), but because the keys are different, the mode’s functions are different. For instance, C major is I in C Ionian, but VII in D Dorian; Dm is ii in C Ionian, but I in D Dorian. Take some time to write out the remaining modes of the C major scale—E Phrygian, F Lydian, G Mixolydian, A Aeolian, and B Locrian—in triads to see how these chords will function in relation to each individual mode. Spend just a little longer with the chords that are found within modes. Example 6a shows triads derived from the G Dorian mode, and Example 6b depicts those from G Mixolydian. For good measure, take a stab at determining the triads in G Ionian, Phrygian, Lydian, Aeolian, and Locrian, too. Writing them out and playing them will help you develop a deeper understanding of how these chords support the sound and feel of each mode. Just as modes can be used to generate melodies, so too can they be used to create chords and chord progressions. The G chord in “Old Joe Clark” from Ex. 4, for instance, is the bVII (rather than the viidim), which comes straight from the G Mixolydian mode. Example 7a demonstrates a typical chord progression drawn from the E Dorian mode. Note that although the iv chord in the key of E minor would normally be minor, the E Dorian’s raised sixth (C#) makes for a major IV chord. In Example 7b, you’ll see the same concept at work with the E Phrygian mode. Here, that mode’s second note, F, makes for a bII chord. 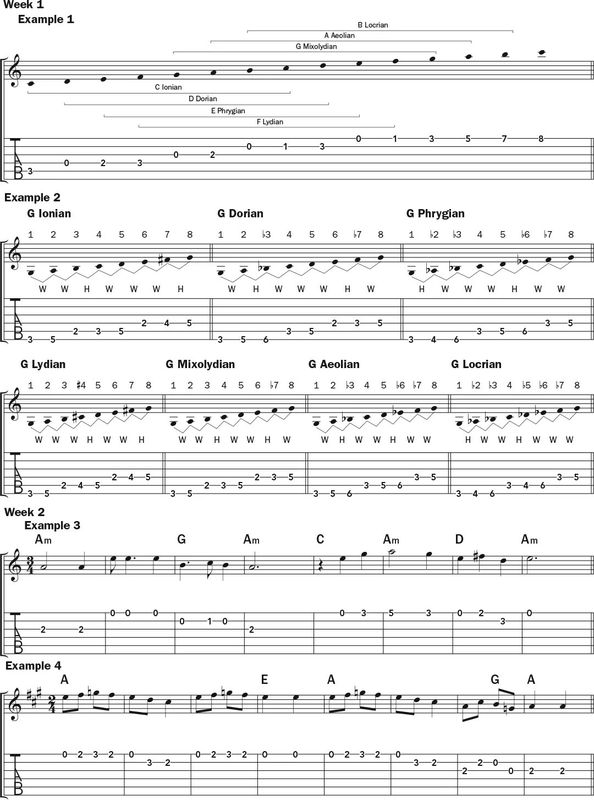 Pick any mode, stack its notes in thirds (as in Examples 5a–6b), and then select a few chords, beginning with the tonic chord, to create your own modal progression. Example 8 puts together all of this lesson’s concepts in a 12-bar etude, which changes modes every four measures. Although the key signature in bar 1 suggests B minor, the C natural notes give the first four bars a B Phrygian feel. Similarly, the C# notes in measures 5–8 convey the E Dorian mode, and the A naturals in 9–12 lend those measures a B Mixolydian feel. The modes in the etude affect not just the way the melodies behave, but the chords, too. In bars 1–4, instead of the iidim (C#dim) you would expect in the key of B minor, you get a II chord (C/Cmaj7). Likewise, in bars 5–8, there’s an F#m chord rather than the F#dim chord you would expect in the key of E minor. And in bars 9–12, there is a bVII (A major) chord, instead of the viidim (A#dim) you would normally have in the key of B major. Keep in mind that while this lesson covered the seven modes of the major scale, modes can be found in any and all other scales, including the harmonic minor, ascending melodic minor, and so on. Composing within the modes, even just those found within the major scale, can create endless possibilities for new melodic and harmonic colors. Create a basic two-chord vamp using a mode of your choice—I–IV (Gm–C) for G Dorian, for example. Record the vamp, then try improvising over it using only notes found within the given mode. In the 1950s, jazz composers like George Russell and Miles Davis popularized a style known as modal jazz when they began using modes, rather than standard chord progressions, to generate harmonies. Pianists like McCoy Tyner often play chords in stacks of fourths, and the concept works quite well on the acoustic guitar, as shown in the colorful voicings here, all derived from the D Dorian mode. Try using voicings like these the next time you play a piece with a D minor-type chord for four or more measures. based on the mode or modes of your choosing.